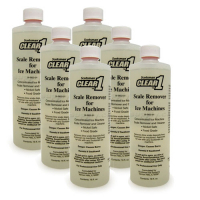 Scale remover for ice machines. Concentrated scale remover and cleaner. Nickel safe, food grade. Removed lime scale deposits from Scotsman ice machines. Approved for use with any Scotsman ice machine.